Founded in 2016, Goldman Casino is a top online casino offering over 400 casino games. 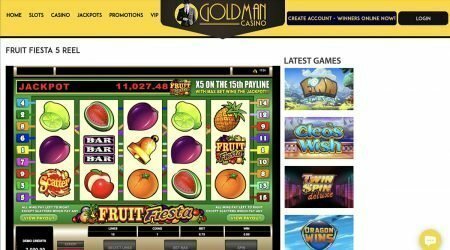 Goldman prides itself on offering customers quality entertainment while providing online gamblers with a fair and secure online environment. Operated by ProgressPlay Limited, the casino is regulated by the UK Gambling Commission and the Malta Gaming Authority. The website is clearly laid out and easy to find your way around. Goldman is currently offering a range of bonuses to both new and existing customers. Its welcome bonus, detailed below, is undoubtedly one of the most generous offered by any online casino, but there are also promotions in place for regular players, including the Monday Madness promo, which allows active players to receive a personalised gift. The casino also offers temporary deposit match bonuses to encourage existing customers to top up their deposit balance. Goldman also has a VIP room for loyal customers, where you’ll be offered discounts, promotions and extra bonuses. Players work their way up through the loyalty levels to receive bigger and better perks, earning an extra point for every £16 spent at the casino. As with any online casino, the promotions team will always be working on something new, so keep an eye out for new offers and bonuses. New customers at Goldman get an extremely generous welcome bonus of up to £1,000 with which to play. As is usually the case, the value of your welcome bonus will depend on the value of your deposits, and Goldman, unlike some online casinos, allows customers to spread their welcome bonus across their first three deposits. When a new customer opens an account and makes a first deposit, Goldman will match the value of that deposit by 100% up to £200. A second deposit will attract a 25% matching bonus up to a value of £300. Place a third deposit and you will receive a 50% match on the value of the deposit up to £500. Obviously, there is a considerable investment required to get all three tiers of the bonus, and as you might expect with such a generous bonus, there are some terms and conditions to meet. The structure of this bonus is aimed at not only attracting but also retaining new customers who like to play big, and who have the funds to keep depositing more money (and, of course, playing with it). A significant sum is needed to maximise all three matching bonuses, reap the rewards, and walk away with all £1,000 of bonus money. 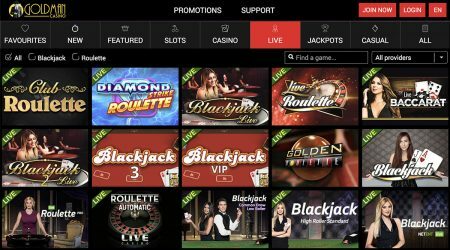 However, for more serious players, this is definitely one of the most attractive welcome packages being offered right now by any online casino. Not prepared to invest the sums needed to claim your £1,000? Remember, these matching bonuses are available on all sums up to the level specified, with a minimum deposit of as little as £10, depending on your payment method. There are, of course, wagering requirements attached to Goldman’s very attractive welcome bonus – a wagering requirement of 50 times, in fact, that must be used before withdrawing any winnings. Add to this the fact that the bonuses are valid for just 90 days and it’s easy to see the type of customer that Goldman is trying to attract here. There are also wagering requirements for other bonuses, so always check the terms of each individual promotion before participating. Check your account regularly to see if there are any new bonuses or promotions for which you may be eligible. Goldman offers over 400 online games with different themes, features and payouts. As with most online casinos, slots make up the majority of the games, with a huge variety from which to choose. There are also a few variations on all the main casino favourites, such as roulette and blackjack, plus limited poker options. Graphics and software are state of the art, and there are live dealer games, including live blackjack and roulette. Goldman works with major names in the gaming software industry, such as NextGen, NetEnt and Microgaming, enabling the casino to offer a big selection of games from a range of different companies, all of which have an excellent reputation – so you know that you will be getting quality games, whichever one you pick. 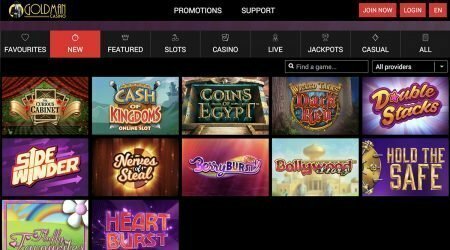 Some games, including all roulette games and many slot games, have a free play option, allowing potential customers to play without risking any money. This allows new players to see how the games work and get a feel for how to play them. You can play for free for as long as you want, and Goldman does not ask for a credit card. You will not have to submit payment details until you are ready to make your first deposit and play with real money. Goldman knows that gaming on the go is vitally important to many online gamblers, and it has provided a great instant play setup, with all games operating seamlessly from any device, allowing very satisfactory play from smartphones and any other mobile devices. Goldman allows you to deposit and withdraw funds using a range of payment methods, including major credit and debit cards such as Visa and Mastercard, Skrill, Neteller, Sofort, GiroPay and paysafecard. UK customers can also pay via phone, allowing Goldman to bill their mobile phone provider for the balance deposited, which can be a very quick and easy way to deposit funds, though this will incur a 15% processing fee. Obviously, all payment methods are dependent on what is available in your country. The minimum deposit varies depending on the payment method, so check the website to find the limit for your payment method. However, for most methods, it is between £10 and £20, or the equivalent in your currency. The minimum withdrawal also varies according to the withdrawal method, and withdrawals can take up to six business days. There is a small processing fee (currently £2.50) for withdrawals. Goldman supports a number of currencies, including GB pounds, euros, and Australian dollars. As part of Goldman’s commitment to responsible gambling, a registered player may set their own deposit limit per day, week or month by providing written notice to the casino. New customers need to be verified before withdrawing money, and this will usually involve providing some form of documentation, which will be explained in an email sent out when you register. Verification takes up to three working days from receipt of documents. It is, of course, important with online gambling that you can access customer support and get answers to your questions quickly and easily. Goldman has an extensive FAQs section, where new customers will find answers to many of the most common questions that might arise. If you have a more specific enquiry, or a problem with your account, then there is excellent customer support available by email and live chat, 24 hours a day. You can also fill in the contact form on the website with any queries you may have. There is, however, no phone support offered at all, so this could certainly be a drawback for some customers. You can also follow Goldman casino on Facebook and Twitter, allowing you to not only keep up with the latest news and deals but also contact the company direct through the social media messaging systems if needed. Goldman provides a great customer experience for online gamblers, providing a variety of slots, table games and card games. The website is clear, well laid out and easy to navigate, and the extensive FAQs section covers most things that new customers need to know. The style of the content on the Goldman website is friendly but professional, and the systems to register and deposit funds are straightforward and intuitive. The generous welcome bonus is a big draw for anyone as any level of deposit will be matched, up to the set limits. The bonus structure makes this casino particularly attractive to big players though. If you have a significant deposit sum, then you will be able to claim that £1,000 bonus, and active players will have no problem using up those bonuses, even given the time limits imposed on them. Wagering requirements on those bonuses also need to be considered, but they are no steeper here than at many online casinos. Customer support is one area where there is a little room for improvement, Goldman provides email and live chat support 24 hours a day, and makes itself accessible via social media, but there is no phone support. Sometimes, customers simply want to pick up the phone and talk to someone, especially if they have a complex problem, which simply isn’t an option with Goldman. Overall, however, Goldman provides a great customer experience, a wide choice of games, and a highly attractive welcome bonus.